Photograph from the 'Curzon Collection: Album of views of Udaipur and Chittaurgarh', of the Jagmandir at Udaipur taken by an unknown photographer at the beginning of the 20th century. 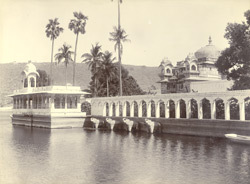 Jag Mandir is one of the main islands pavilions on Lake Pichola at Udaipur, built in 1551. Gul Mahal, the main palace on the island, is a small sandstone pavilion with three circular domed chambers, one above the other, entered through a columned hall. Two marble chhatris with sloping cornices rise above the main facade. The palace was built in a Mughal style and completed under Maharana Jagat Singh I in the middle of the 17th century. Arcades with cusped arches are built at the edge of the island where there are almost life-size marble elephants carved in the round.